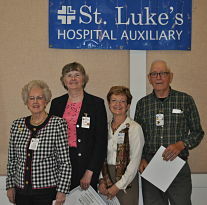 St. Luke's Hospital volunteers provide warm, caring and compassionate attention to our patients, their families and our staff. From clerical positions to courier routes, our volunteers have the opportunity to lend a helping hand in their own special way. Volunteers typically contribute between 2-4 hours each week. Some benefits for our volunteers include free flu shots, a free beverage during each shift, or a free meal if on duty at mealtime, along with our annual volunteer appreciation luncheon. Patient Care Volunteers: These volunteers offer juice and daily newspapers to our patients each morning, along with a warm smile or calming conversation. As a patient care volunteer, you'll be brightening someone's day -- and yours in turn. Daily Couriers: The afternoon volunteers deliver lab results and mail to local physician offices. Gift Shop: Volunteers in the Gift Shop manage the daily operations, handle sales and keep the shelves stocked and tidy. 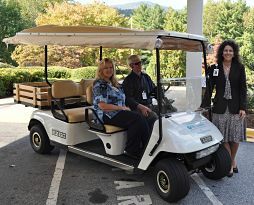 Golf Cart Service: One of the volunteer services unique to St. Luke's Hospital is our daily golf cart transportation. As visitors arrive, they are greeted by our smiling volunteer and are offered a ride up the hill in the golf cart to the front door. Reception Desk: These volunteers are among the friendliest you'll find! They are responsible for greeting visitors and assisting with patient information, such as directions to patient rooms and other hospital departments. WINGS: On the "WINGS" of these special volunteers, mail is picked up in the hospital and delivered throughout the hospital daily. Two shifts are available. Print Shop: This ambitious group contributes to the hospital by running the in-house print shop. They produce forms, business cards and other printed materials for the hospital. Clerical: Volunteers also help out with tasks such as filing and computer input in the various departments. Junior Volunteers: Weekdays, during the summer months, we have opportunities for local high school students. This includes delivering juice to patients, stocking shelves, answering phones, etc. Junior Volunteers must be 14-18 years old. Each year, monies generated by volunteers through the Gift Shop and other activities are used for scholarships for local high school graduates and hospital employees who are entering higher education in the healthcare field, especially areas of critical need. In addition, these monies are donated to the hospital for the purchase of new equipment and/or other needs. New volunteers are always welcome. Contact Dawn Ward at (828) 894-0895 or email for information on available volunteer opportunities. You can complete the volunteer application here.